Tis the Christmas season and I'm loving it as always. Aside from being busy and a lot going on in the past month - I left my job of 7 years and started my new full time counseling career on Monday!, passed my NCE counseling exam on Friday, and have been finishing up my last semester of grad school and applying for my licensure - I am super excited for Christmas! I always love shopping for presents for my loved ones... it's the best part! And holiday cookies, of course! 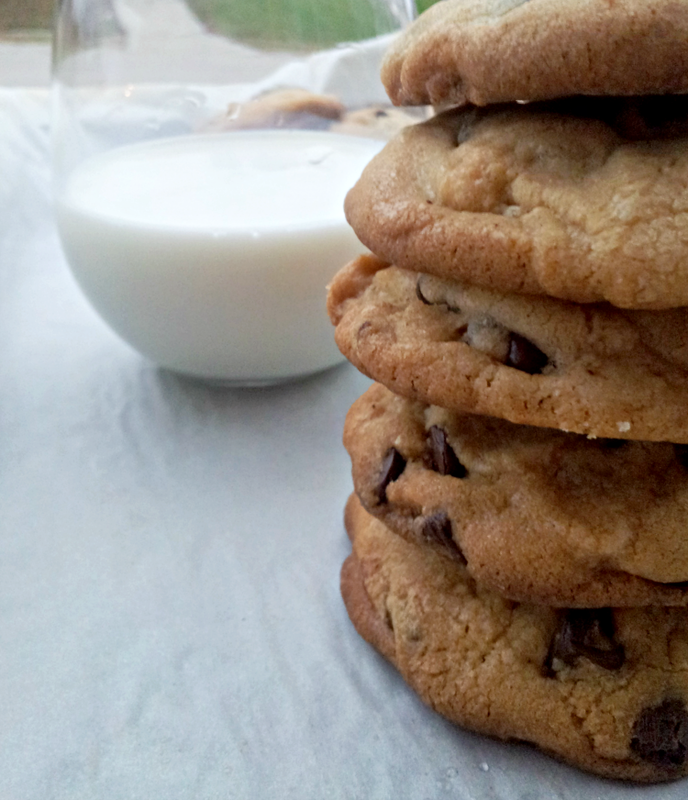 This month we're taking a break from the Secret Recipe Club and some of us are participating in a Cookie Carnival. It's all about the cookies, baby! I was assigned to Julie's blog, The Texan New Yorker. I've never been to Texas OR New York, so cool! We sound like we have something in common because she used to be a picky eater like me but has expanded her horizons and now enjoys all kinds of foods like I do! She had some tasty cookie recipes to choose from, but brown butter. That's all I gotta say. Brown butter. 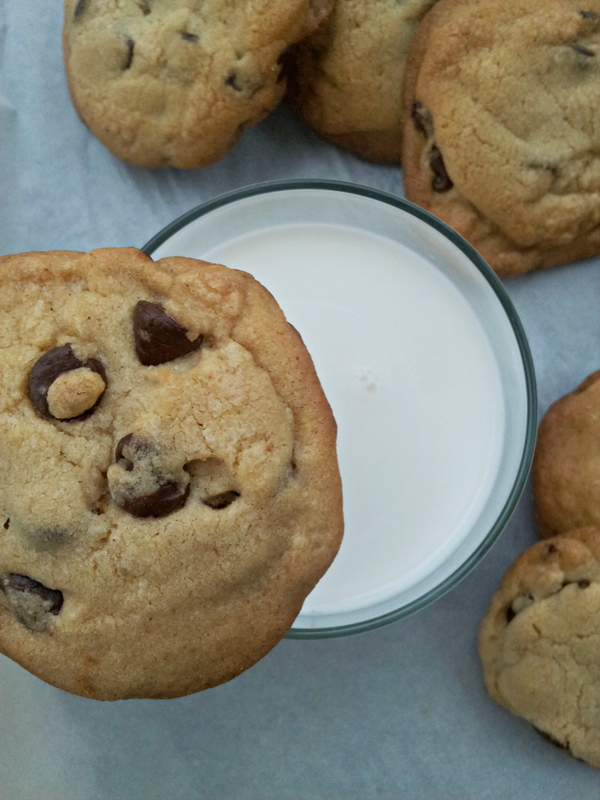 What better way to make a classic chocolate chip cookie even tastier? Add brown butter, that's how. You already know how I like to add brown butter to desserts. 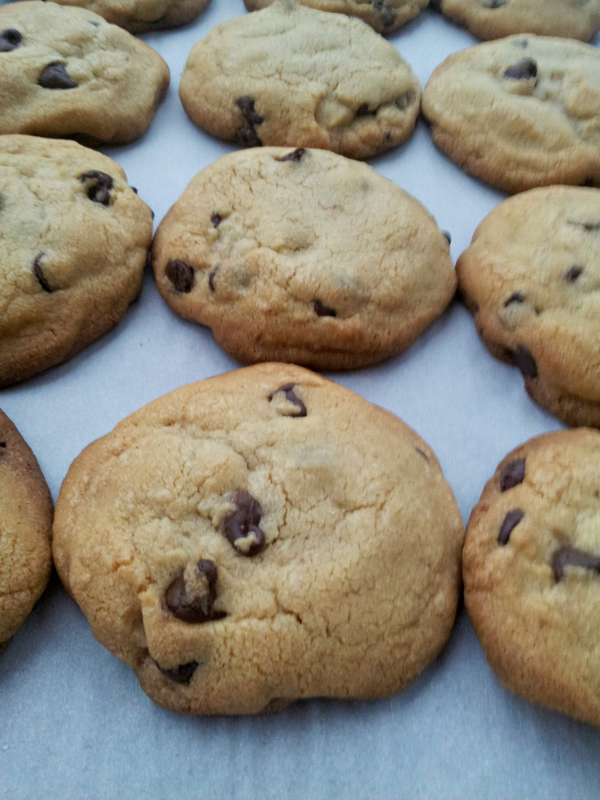 So I had to go with her Brown Butter Chocolate Chunk Cookies. I actually did heaping tablespoons on one batch and they came out thicker and more cake-like. On the second batch I used tablespoons and flattened the dough and they came out crunchier and thinner obviously. PJ preferred the thick cake-like ones, but I also like the crunchy thin ones. Point is, they're good either way. To brown the butter, melt 1 stick plus 1 tablespoon butter in a medium, silver-bottomed skillet over medium heat. Once completely melted, the butter will foam, froth, and make a crackling noise. This is the water cooking out. Swirl the pan gently and occasionally during this process. Once the water is cooked out, the butter will begin browning. This happens quickly, so do not walk away or attempt to muti-task here. Once the solids reach a rich, chestnut color, remove the butter from the heat and immediately pour it into a separate container. Scrape all the browned bits from the bottom of the skillet. It should smell rich and nutty with no traces of anything burned. Let the butter cool a bit. In the bowl of a stand mixer fitted with the paddle attachment, cream the remaining 1 stick softened butter with the granulated sugar on medium speed until light and fluffy, 3 to 5 minutes. Add the vanilla extract and molasses; beat until incorporated. Once the brown butter has cooled somewhat, pour it into the creamed butter mixture, along with the brown sugar. Cream about 2 minutes until well incorporated. Add the egg and egg yolk, and beat for 1 more minute. In a medium bowl, whisk together flour, salt, and baking soda. Add the flour mixture, all at once, to the butter mixture and beat on low speed just until the flour is incorporated. Remove the bowl from the stand mixer and fold in the chocolate chips with a spatula. Cover the bowl with plastic wrap and chill in the refrigerator for 30 minutes. Meanwhile, preheat your oven to 375 F. Line 2 baking sheets with silpats or parchment paper. Roll tablespoons of dough into balls and space about 2 inches apart on the baking sheets. Bake cookies 12 to 14 minutes until lightly browned on the outside, but still soft and tender in the center. Remove from the oven and let rest for 5 minutes on the baking sheets. Then transfer the cookies to cooling racks. Eat warm or at room temperature.